“Every act of every man is a moral act, to be tested by moral, and not by economic criteria.” – Robert Maynard Hutchins. Global warming remains an issue of political debate, often split along the lines of developed and developing nations. 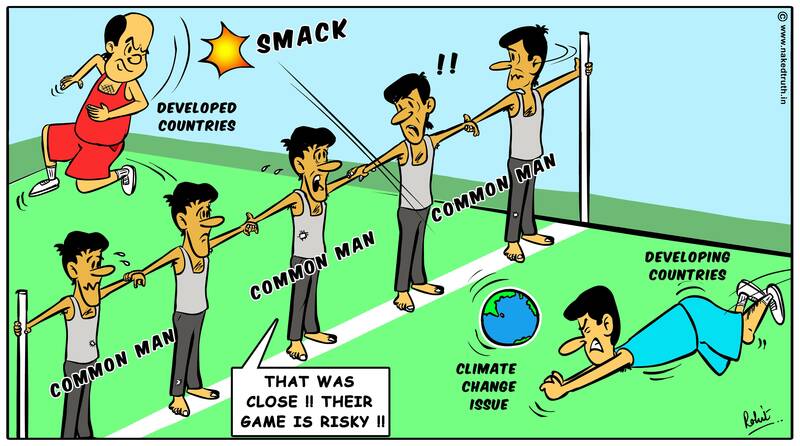 In two decades of climate change negotiations, a deep divide has remained between developed rich countries and developing poor ones, blaming each other, and each side insisting the other move first to lower the carbon emission and curb the effects of global warming. Developing poor countries logically resist this lobbying to decrease their use of fossil fuels, pleading that the CO2 emissions of all the countries put together are still less than 30 percent, as compared to 70 percent of only top seven polluting countries of the world. The developing countries believe the politics of global warming is complex and climate science has been highly politicized. It is believed that the United States is using the climate change policy as a tool to control the economies of the developing countries. The blame-game is on, life is at the danger level, and it is predicted that in next 100 years, life will be extinct. It’s us who have to score and find the ball in the court, yet Smack!